DURHAM, N.C., and SAN JOSE, Calif. Feb. 10, 2010 — Duke University and Cisco today unveiled a first-of-its-kind virtual lecture hall for students enrolled in Duke’s Fuqua School of Business in Durham, N.C. Custom-built using Cisco TelePresenceTM technology, the new lecture facility provides business school students with access to professors, business leaders and guest lecturers located around the globe, extending the in-person classroom environment across campuses and into the business world. Cisco TelePresence provides students and professors with an immersive, lifelike communications experience that combines high-definition video and high-quality audio to realistically convey the body language and human elements that are critical to the interactive nature of a classroom. The new virtual lecture hall will also help presenters extend their expertise beyond the physical campus to students across multiple campuses as though they were sitting in the same room. Duke University Dean Blair Sheppard unveiled the new lecture hall by leading a CEO Master Class on Feb. 5. A select number of Fuqua Business School students were invited to participate in this interactive conversation with Cisco Chairman and CEO John Chambers and Kleiner Perkins Caufield & Byers partner John Doerr, who joined the students from Cisco headquarters in San Jose, Calif. Tony O’Driscoll, Fuqua’s professor of the practice, also participated in the session via Cisco TelePresence from New Delhi, India. The custom-built lecture facility includes three 103-inch plasma displays, six 1080p cameras for both panoramic and lifesize immersive video experiences, an instructor’s podium with two document cameras for sharing class materials, three remote student displays for the instructor to view remote classrooms from the podium, and 66 custom push-to-talk microphones for interactive discussions. Initially providing businesses with virtual meetings, Cisco TelePresence has quickly evolved to deliver new virtual experiences. Organizations now use Cisco TelePresence technology for lectures, training, brainstorming, remote demonstrations, and webcasting and recording, turning TelePresence rooms into broadcast studios. With Cisco TelePresence, educational institutions can bring teachers and professors with specialized expertise to students around the world efficiently and economically, empower richer and more productive collaboration for research purposes and create new educational opportunities, such as global classrooms and customized executive education programs. 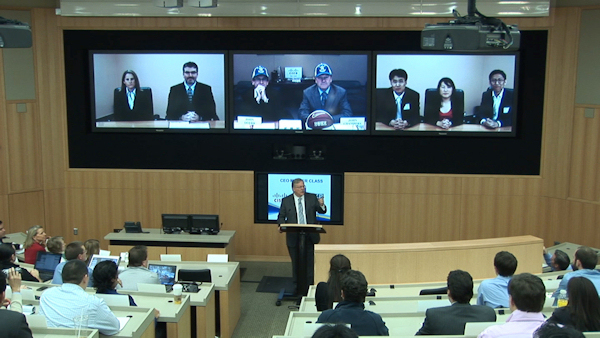 Virtual learning environments created by using Cisco TelePresence help colleges and universities embrace environmental sustainability goals through the reduction of travel, while extending the reach of university experts and attracting new students. Cisco works with a number of research networks and consortiums, including the U.S.-based national research network National Lambda Rail, a not-for-profit advanced networking consortium, which owns and operates a national Cisco TelePresence Exchange to promote the use of Cisco TelePresence among higher education institutions. More than 550 organizations have contributed to Cisco’s footprint of more than 3,500 Cisco TelePresence rooms deployed worldwide. Cisco has also installed more than 685 Cisco TelePresence rooms on its own internal network in 47 countries for greater productivity and effective collaboration. Cisco, (NASDAQ: CSCO), the worldwide leader in networking that transforms how people connect, communicate and collaborate, this year celebrates 25 years of technology innovation, operational excellence and corporate social responsibility. Information about Cisco can be found at http://www.cisco.com/. For ongoing news, please go to http://newsroom.cisco.com/. This entry was posted in Presence in the News. Bookmark the permalink. Both comments and trackbacks are currently closed.